A's persistent borrowing to finance the deficit would lead to increasing indebtedness. Beyond a point, its financial health might begin to cause B some concern who, worried about repayment, might curtail lending. At this point, much-needed capital dries up and as confidence in A's financial well-being erodes progressively, investors would begin pulling out capital, leading to depreciation in A's home currency. To prevent continued depreciation and lend support to its currency, A could (1) utilise foreign currency reserves and/or (2) borrow. (2) is not a good option in situations similar to those in the above paragraphs (would lead to further erosion of investor confidence). Many countries through history have resorted to (1), and then (2); before complete erosion in confidence led to obliteration. Working off this (highly) simplified example, we turn to India's Trade situation. 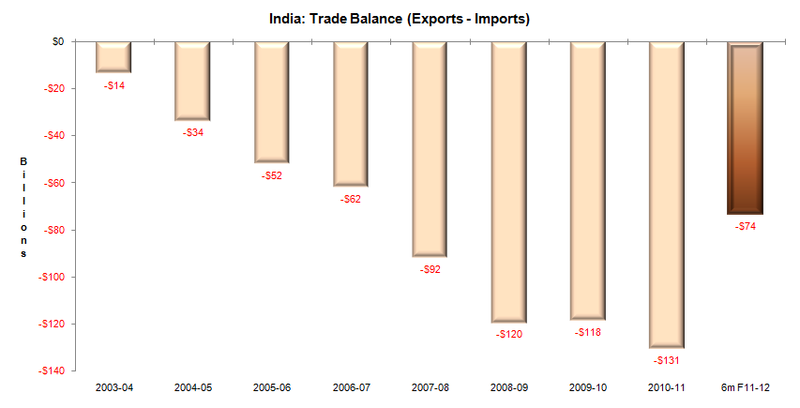 The flat INR helped buoy imports, which grew 25% p.a., over the past 7 years. Exports, during the same period, grew 21% p.a. 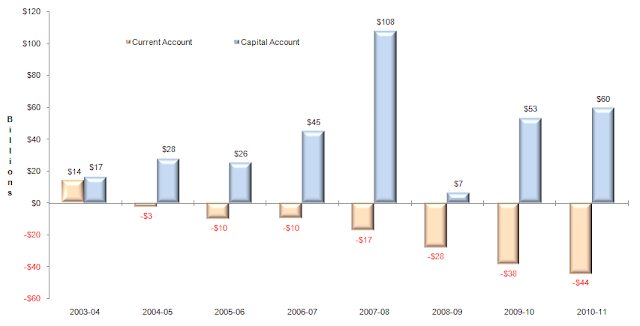 The progressive deterioration in trade balance necessitates a counter-weight through inflows of capital. Unlike its Asian peers, India does not enjoy surpluses on its current account, thereby exposing it to the vagaries of capital flows. 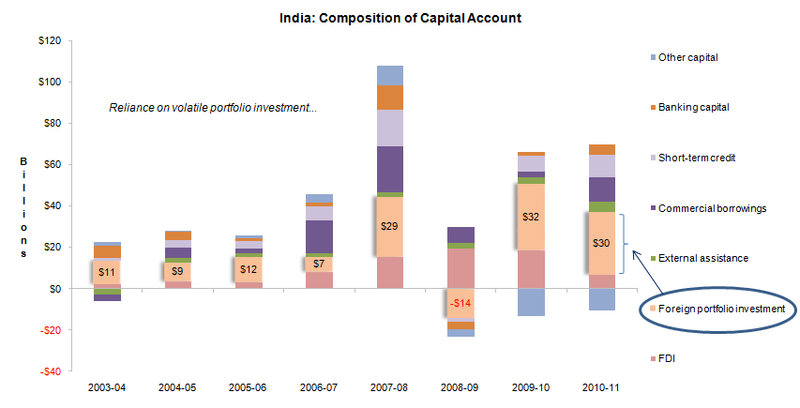 In the past, India has been somewhat heavily reliant on foreign portfolio flows, followed by credit, to fund the current account deficit. 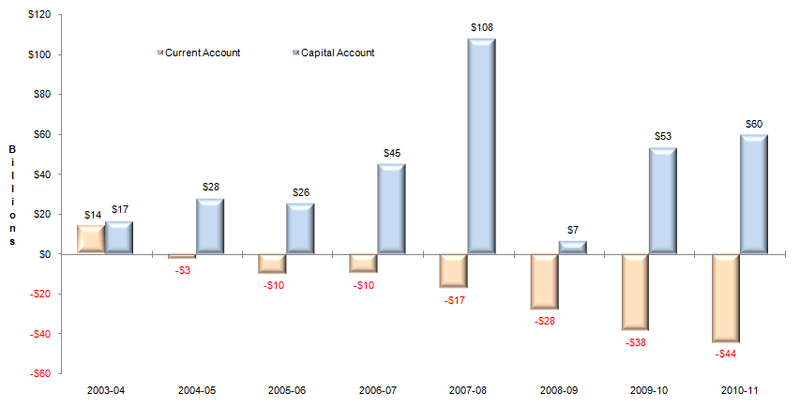 In 2008-09 when net portfolio investment was negative and credit dried up following the credit crunch, India had to dip into its foreign currency reserves to make good the shortfall. Part of the hypothesis behind the INR's prospective weakness is centred around this possibility. For the first 6 months of the current fiscal, net capital inflows were $40 billion, with FDI contributing over 50%, followed by External Commercial Borrowings (ECB). The more volatile foreign portfolio investment has been negligible this year, largely a reflection of the global macro environment, flight-to-safety and eventually, flight-to-cash. The influx of longer-term FDI capital is a welcome development. In this backdrop, the recent backlash on FDI in multi-brand retail comes at an inopportune moment. Superimposed on a political environment characterised by credibility deficit triggered by corruption issues and frequent policy flip-flops, tapping the ECB route for funding seems the path of least action, going forward. INR History: An artificially high level? The growth in M3 - a money supply measure - over the long-run has been an important carrier of information on inflation (evidence from around the world: here, here, here). Over time, inflation chips away at the purchasing power of currency. Given the divergence in India's true inflation and those in developed market economies, the INR should have trended down over the years. While it wiggled up and down, the INR stayed flat over Dec-03 - Jun-11, even as money supply and credit expanded strongly. Viewed in this context, a combination of foreign portfolio capital flight due to jittery global markets and persistently high inflation, have finally managed to trigger a long-overdue correction in the INR. India's current total external debt = $316 billion. $68.5 billion of this amount is short-term, making up 43% of residual maturity (historical levels). Foreign currency reserves cover ~8 months of imports. Assuming that the maturing short-term debt is fully rolled over and the trade deficit at the end of fiscal '11-12 = $150 billion, India's incremental capital requirement through Mar-12 is likely to range between $20-30 billion. With external debt at < 20% of GDP and debt service coverage ratio at 4.5x, solvency is not a central issue. Refinancing could largely be contingent on the EU situation. Any deterioration on that front could put some pressure on debt roll-overs, by way of availability of refinance and/or cost. In the worst scenario, India's foreign reserves should be able to cover the maturing short-term debt comfortably. What could support the INR? The strong pace of economic growth over the years has stoked inflationary pressures, which is persistently above the RBI's comfort zone. Prioritising inflation combating over growth, the RBI embarked on a rate-tightening regime over 2010-11. This interest-rate stance has been one of the factors supporting the INR, so far. As the world dipped into recession and interest rates headed towards the zero bound, investors hungry for yield found succour in high-interest rate markets such as India. Economic growth and investment activity are exhibiting signs of slow down, while industry and consumer expectation surveys paint a gloomy picture. The continuing issues in the EU is likely to persist into 2012. In this backdrop, rate hikes by RBI, going forward, appear low probability. If anything, should economic growth slow down, a reversal of RBI's interest-rate stance is highly likely, which would reduce the INR's allure. -1. Given the negative real interest rates and political gridlocks repeatedly scuttling policy initiatives, the prospect of foreign portfolio investors returning to India with gusto appears grim. ECB seems the most likely route to be tapped, weakening INR notwithstanding. -2. There's a growing chorus of voices urging intervention from the RBI to stem depreciation. The RBI's few attempts so far hasn't had the intended effect on market participants. Unlike its Asian peers, which may recycle trade surpluses to support their currencies, India's deficit situation reduces its room for manoeuvre. The RBI has voiced its intention of resorting to Open Market Operations and tapping other levers should push come to shove (jigging the Cash Reserve Ratio/Statutory Liquidity Reserve). A turn in RBI's hard interest-rate stance seems likely, going forward. Continued reliance on foreign currency borrowings appears to be the most likely outcome. In the best case (low probability), the INR is likely to wiggle sideways, while progressively introducing hurdles in the form of domestic and global macro issues (higher probability) quickly weakens the case for a long INR. Nice analysis done here. Please indicate the sources for the numbers discussed. I think this pressure situation is going to do India some good. Like in 1970s when US didn't allow Cray machines to be sold to India for the nuclear programme and still we managed to get it done successfully, in times of pressure, the government will perform. One area I see the government hasn't really put in much is silicon chip fabrication plants (fabs). I see them as very vital to the growth and security of this nation as they are the building blocks of indigenous electronic technology. Countries like China, France(ST), US, Taiwan(TSMC) have their own fabs and are creating their own chips thereby decreasing their reliance on pvt companies and other governments. I think India's bill for electronics import is high enough now ( $27 billion ) to start having its own fabs in place. This investment on the government's part will go a long way reducing the trade deficit and dependence on other governments. I agree. Depreciation isn't necessarily a bad thing. One just hopes that it encourages India to think hard about progressively positioning itself in the higher-value added portions in the trade value chain. However, unfortunately in many cases, problems tend to have shorter time frames than benefits! In the short-run, due to its continued import dependence, the squeeze could be painful. One has mixed thoughts about fabs in India. Due to the high cost differential w.r.t existing options, the solar industry is fated to survive on continued government subsidies. A glance at Europe through the 2000s decade would reveal the perils of high cost and reliance of subsidies. When Taiwan and China came along with lower cost manufacturing, the EU solar industry was quickly brought to its knees. For a brief history, over '04-07 the favourable demand-supply situation in polysilicon (raw material) and liberal government subsidies attracted supply. By 07-08, the balance had turned in supply's favour, and the recession rendered continued subsidy support a difficult proposition, in the wake of austerity measures. These led to prices collapsing >90% in 3 years...and they continue to trend down, as the market works off to correct the excess supply situation. In this backdrop, augmenting capacities of indigenous silicon raw material, which is presently very low in India, is tough to justify. As primary material prices collapsed, so did prices further along the value chain (wafers, cells, panels..). Indian modules facilities currently operate at <20% installed capacity. The correction is demand-supply equation will take a few years. Till such time, augmenting capacities is a dodgy proposition. Enhancing subsidies to this sector when the country stares at a widening budget deficit is another issue. There's the SIPS (Special Incentive Package Scheme) which was put in place to provide a fillip to fab installations and the National Solar Mission (NSM), aimed at encouraging long-term investments in this sector. The NSM admits that solar may achieve parity with coal-based thermal power only by 2030. Its environment friendliness notwithstanding, it will be very many years before solar becomes a viable proposition in comparison to other energy options. The fastest way to achieve parity is to explore technologies that will pull down costs to viable levels. Till such time that this process is under-way, perennial subsidies would be needed to fuel the engine. Given all this, one isn't entirely sure if more focus on this sector should be called for at this juncture, especially when differentiation with Taiwan and China is low and no unique competitive advantage appears in sight. Would love to hear an alternative view. Check out the Statistics section. Its a maze but contains all the information!